Mold And Your Health: Does Being Exposed To Mold Cause Health Problems? There are obvious ways in which we set out to maintain a healthy lifestyle, including eating healthy foods, exercising regularly, and getting adequate sleep. What’s not always so obvious is ensuring your home is maintained to prevent exposure to harmful substances. One particularly harmful substance that is found in every home to some extent is mold. Many wonder about the impact of mold on health, asking can mold causes rashes, can mold cause hives, and can mold causes lasting health issues? Left untreated, large overgrowths of mold can have a serious impact on the health of you and your family, such as mold rashes. Fortunately, there are steps you can take to protect those you love against mold, treat mold skin rashes, and remove existing growth to prevent future growth. What is Mold and How Does it Grow? The term mold is used to refer to fungi that grow in multicellular, thread-like hyphae structures. While mold is a common sight on foods and beverages that have spoiled, it can also be found in damp, moist areas of buildings. Moisture is integral to the growth of mold. As a result, mold can be caused by the use of air humidifiers, plumbing leaks, flooding, or any other opportunities for humidity to gather. Spaces such as basements and crawl spaces are particularly prone to mold growth as these spaces often lack proper ventilation, resulting in increased moisture and humidity. Determining the exact type of mold growing in your home is difficult for the average person, as there are many types that range in color. The most well-known type of mold is referred to as black mold or toxic mold. Most homeowners know to be on the lookout for black mold, as this type of mold can cause health issues. Molds can result in health issues because they release very small, lightweight spores into the air that can then be inhaled by occupants of a house. Simply through inhalation, mold spores can travel deep into the lungs. So, just how dangerous is mold? Coming into contact with mold does not automatically result in health issues. In fact, most of us will come into contact with some amount of mold every day through touch, eating, and breath. However, prolonged exposure to mold when its growth is active and extensive can promote problems with health. The most common symptoms of mold exposure are those often associated with allergies, such as eye irritation, coughing, sneezing, and wheezing. Symptoms resulting from mold can range from mild to severe. Those that are particularly sensitive to the effects of mold or those with prolonged exposure can experience very serious issues, such as shortness of breath, fever, lung disease and infections, hair loss, anxiety, muscle cramps, and memory loss. Can mold cause rashes, and can mold cause hives? Yes. Another issue that can result from exposure to mold is mold rashes and hives. In some cases, when the body’s immune system kicks in to protect again perceived threats such as mold, large quantities of antibodies are produced to attack the threat. This reaction can result in irritation and inflammation of the skin, and a mold rash is visible. Unfortunately, mold rashes and mildew rashes can be particularly itchy, however, it is important not to scratch to avoid breaking the skin and putting yourself at risk for infection. There are a few populations that are especially vulnerable to the harmful effects of mold, and who are at higher risk for mold skin rash and mildew rash. These populations include those with respiratory issues such as asthma, those with compromised immune systems, the elderly, and infants. Infants are susceptible to the harmful effects of mold because their immune systems are still developing. Additionally, little ones come into contact with surfaces that hold dust and mold spores, such as floors, putting them at a greater risk for inhalation and ingestion of substances of concern, in addition to mold rash and mildew rash. To protect those at special risk for mold rash, treat symptoms of mold exposure and remediate mold overgrowths as soon as they are discovered. There are a few ways to treat health issues brought on by exposure to mold. Someone suffering from a mold rash or mildew rash can take oral antibiotics to address the infection. While antibiotics work most of the time, in especially severe cases of mold rash more intensive treatment methods and even hospitalization might be necessary. Additionally, there are topical ointments for a mold skin rash that can help with itchiness. Another way to treat exposure to mold apart from mold skin rash is the use of nasal sprays or rinses. These items, which can be purchased over the counter, effectively reduce inflammation of the airways that result from mold allergies. You can also create your own rinse at home by mixing distilled water and saline and pouring through your nasal passages to remove mold spores and reduce congestion. Antihistamines, decongestants, and medications to reduce mucus are all also effective in helping to treat conditions and systems associated with allergies and exposure to mold. If you suspect mold is having a negative impact on your health, contact your doctor to schedule a blood test to determine if you have in fact been exposed to harmful amounts of mold. If this is the case, you can then discuss treatment options and preventative measures to take to protect the important systems of your body. The best way to protect your health and health of your loved ones from mold skin rash and other health effects is to stop it from growing altogether. One of the best methods for preventing exposure to mold is by ensuring air ducts in your home are kept clean. The air duct cleaning process involves removing dirt and debris from the heating and cooling systems in a house used to transport the flow of hot or cold air when heat or air conditioning systems are engaged. When left with a buildup of debris, these substances can spill into the air, reducing quality and resulting in harmful effects. It is therefore recommended that homes receive an air duct cleaning every 5 to 7 years. Another method for preventing the growth of mold is by ensuring damp spaces such as the basement or crawl spaces are well ventilated and dry. Where moisture exists, mold growths. 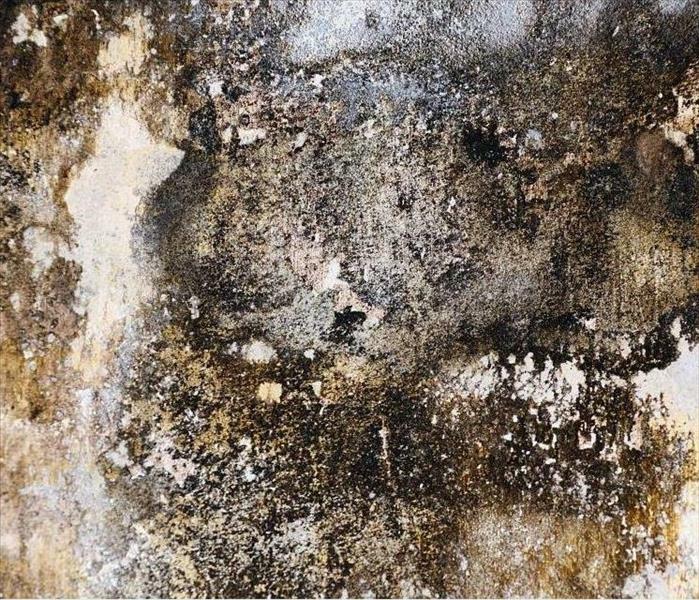 If you notice signs of water damage in your home, such as discoloration of walls, a musty odor, or cracking in the foundation, you are at a higher risk for the development of mold. Ensure your home is properly waterproofed and sealed. Should water damage or flooding occur, conduct repairs immediately and disposed of furniture or belongings that you cannot successfully dry. What To Do When Your Basement Floods? As most homeowners know, unexpected problems are a reality of owning a house. Walking downstairs to find water in the basement after it rains can be a particularly unsettling sight that leaves many individuals unsure of what to do next. But, why is my basement flooding? Should you be asking yourself what to do when the basement floods, there are specific steps to take to get it back to normal and how to stop basement flooding. Rain-associated problems: while basement flooding can occur with dry weather, water in the basement after it rains is most likely. Cellar flooding after heavy rain can happen for a number of different reasons. For example, if your home is not properly graded, water will not be directed away from your house. This means water can find its way through cracks and holes into the basement, resulting in basement floods during heavy rain. In addition to improper grading, cracks in your home's foundation can result in cellar flooding after heavy rain. It is important to regularly scan the walls of your basement for cracks, as they are one of the most common culprits of water in the basement after it rains. Sealing cracks is key for how to stop basement flooding. Another rain-associated challenge is clogged gutters and downspouts. When this happens, water will not be properly diverted far enough away from a house’s foundation, resulting in water in the basement after it rains. Sump pump failure: A sump pump can be installed in a basement to collect water in a designated pit, then pump the water out and away from the basement to ensure it stays dry. When a sump pump isn’t working properly, whether due to a power outage or heavy rain, you are at risk for basement floods during heavy rain. Sewer backup: A particularly unpleasant answer to “why is my basement flooding?” are basement floods during heavy rain caused by a sewer backup. When city sewers overflow, you might experience a flow of sewage back into your home through drains or toilets. This can then lead to flooding in the basement. Even before flooding in your basement occurs, there are signs to keep an eye out for that can indicate water damage, and help you figure out how to stop basement flooding. For example, you might notice changes in the color or texture of surfaces in your basement. Paint can begin to peel, wallpaper might pucker, or yellow or brown stains might appear on the walls. You might also notice that carpeting begins to take on a spongy feel, indicating trapped moisture below. Another sign of water in the basement after it rains is an unpleasant odor. As moisture collects in the basement, you might experience a strong, musty odor that doesn’t go away. This odor is likely coming from mold or mildew growing in your basement, indicating water damage. 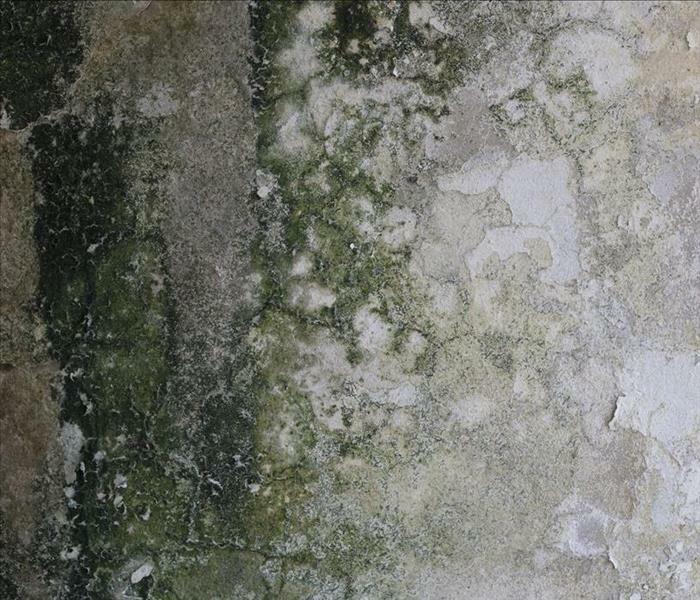 In addition to the smell of mold, you might also visibly spot mold growing in your basement. A final indicator of water damage in your basement are cracks in the foundation. A buildup of moisture over time can cause the foundation inside and outside of your home to crack due to inadequate draining. Without proper sealing, cracks can lead to flooding. 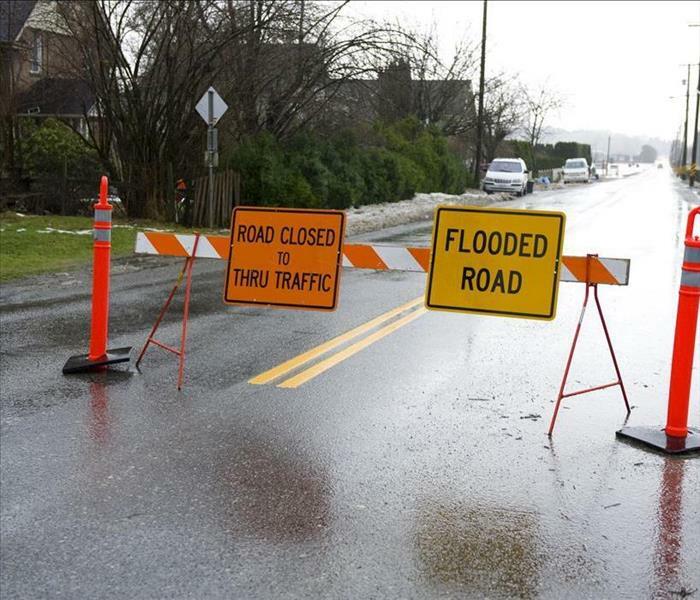 Catching these signs early and making the appropriate repairs are helpful for how to stop basement flooding, protecting your basement and saving you money. If you don’t know what to do when basement floods, don’t panic. Take the following steps and precautions to handle the situation safely and effectively. Address the flooding immediately. When there is water in the basement after it rains, you may think putting off the issue for a day or two won’t cause additional harm. However, sitting water in the basement after it rains can lead to structural damage as well as the growth of harmful mold. Taking care of the problem as soon as possible can better protect the health of your family and prevent further damage. Shut off any power and gas in the basement. One of the most important reminders for what to do when the basement floods is to never enter a flooded basement when the power is on, as this poses a great risk to your safety. If you are not sure if the power is properly turned off, contact an electrician immediately and do not enter the space. Wear protective gear. When wading in water in the basement after it rains, it’s important to protect yourself by wearing gloves, boots, and mask. Walking around a flooded basement poses a slipping risk, therefore wearing boots with adequate grip will help keep a sturdy stance in an unstable environment. Having gloves and a face mask on hand will prevent you from coming into contact with harmful substances or spores that may have been unearthed during the flooding. Determine the source of the water. This step is essential for determining how to address the flooding. Whether from a burst pipe, rainfall, or sewer backup, you’ll need to know where the water is coming from to make the necessary repairs. Begin the water removal process. The amount of water that has collected in the basement will inform which method to use to remove the water. There are a few options available, such as wet/dry vacuums, sump pumps, or pool pumps. Once most of the water has been removed, grab towels or sponges to soak up any remaining moisture. Dry off damaged items and discard what can’t be salvaged. If your basement floods during heavy rain, you will likely need to rip up and discard carpeting. This is because it is particularly challenging to fully dry carpeting that has been wet without running the risk of mold or mildew growth. 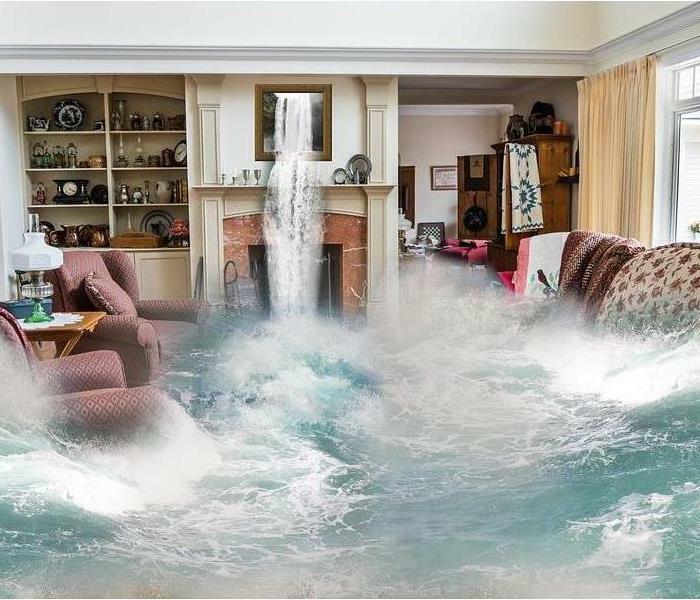 Furniture or other belongings that have been drenched in the flooding should be removed from the basement and moved to a well-ventilated space to dry off. Ventilate and clean the area. Finally, you’ll want to open any doors or windows in the basement to promote faster drying. Then, wash off any visible dirt that may have accumulated on the floors or walls as a result of the flooding. Contact a professional. If you don’t know how to stop basement flooding or are still asking yourself why is my basement flooding, contact a specialist to assist you with the process. How Much Should I Expect To Pay For An Air Duct Cleaning? The reality of being a homeowner is that regular maintenance is required to keep everything in working order, from landscaping to roofing repairs, vacuuming, to cleaning out gutters. On your list of things to do around the house, however, having your air ducts cleaned may not be at the top. But just how important is it to have your air ducts cleaned, and what are air duct cleaning prices? As you consider air duct cleaning costs and the time required to have air ducts clean, learn what air ducting cleaning is, how important of a process it is for your home, and how much air duct cleaning costs are. Your air ducts are responsible for the flow of hot or cold air throughout your home through the house’s heating, ventilation, and air conditioning (HVAC) system. As you can imagine during the balmy days of the summer or frigid winter nights, the HVAC system is essential to your family’s comfort. Air ducts can typically be found in ceilings or walls. The most obvious benefit to these locations is that they are hidden, thus keeping the not so aesthetically pleasing HVAC network out of site. Depending on the type of home, houses can have either rigid or flexible air ducts. With flexible air ducts, tube-shaped bendable plastic is covered with a wire coil and surrounded by insulation. The benefit to flexible ductwork is that it is easy to install, and can fit into tight areas of the house. Flexible ductwork does require minimal bends and kinks. On the other hand, rigid ductwork can be constructed from a variety of materials, such as fiberglass or sheet metal. Further, rigid air ducts are built in various shapes and sizes. Many homes are constructed with rigid ductwork as, in general, they are more reliable and durable than flexible ductwork. Whether your home is outfitted with rigid or flexible ductwork, they face a similar challenge. The downside to their hidden location in ceilings or walls is that these spaces are prime spots for collecting dust and other debris. According to the Environmental Protection Agency (EPA), air duct cleaning is defined as the cleaning of forced air systems in your home, like those that provide heating and cooling throughout a house. This includes supply and return air ducts, grilles and diffusers, drip pans, fan motors, and heating and cooling coils. Some of the most common areas of the house that require air duct cleaning include dryers, vents in each room that collect dust and debris, as well as the furnace. Because of the complex nature of the air duct network, many homeowners are unsure of whether to undertake the process of cleaning air ducts. 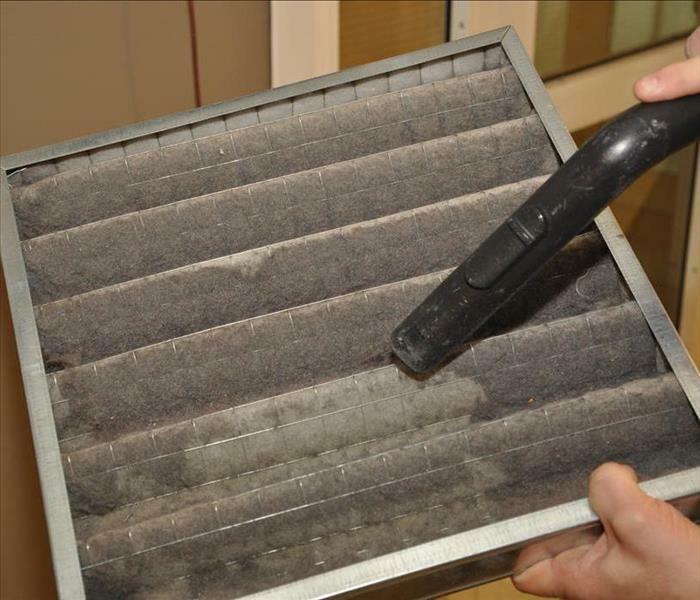 So, do you have to clean your air ducts? Yes, proper cleaning of your air ducts is important. Over time, your air ducts collect dirt and debris that can then be transported throughout your house through the ductwork system when you engage your heating or air conditioning. Recirculating this air can diminish air quality, leaving individuals or pets at risk, particularly those with respiratory conditions, environmental allergies, or autoimmune disorders. In addition to improving the air quality of your home, cleaning your air ducts can help save energy and money. It is estimated that up to 40% of the energy the average home uses to heat or cool the house is wasted as a result of dirt and debris built up in air ducts. This is because the system must work harder to bypass the contaminates, even when filters are in place. By cleaning air ducts, your heating and cooling systems do not have to expend as much energy to reach your desired temperature, thereby decreasing the amount of time you use your heat or A/C. Next, we look at air duct cleaning prices you might expect to pay. How Much Is Air Duct Cleaning? You’re likely asking yourself, just how much is air duct cleaning? Depending on the type of air ducts you have, the size of your home, and the air duct cleaning company you select, the overall air duct cleaning cost can vary. On average, however, air duct cleaning costs will be between $400 and $1000. Included in this air duct cleaning cost, a specialist will examine your home, noting the number of vents, returns, and systems to determine a comprehensive price. In general, the most common breakdowns of price you might encounter include cost based on square foot of the home, cost based on a number of systems, and separate furnace cleaning cost, vent cleaning cost, dryer vent cleaning cost, and return cleaning cost. Added on to air duct cleaning prices are additional air duct cleaning costs for remaining vents and returns. No matter how the company you choose breaks down the air duct cleaning cost, never select a company that charges per hour. In this case, you are likely to be charged air duct cleaning prices well above the average cost for this service. Before paying any company air duct cleaning cost to provide home maintenance services on your home, it is important to do your due diligence. In this field in particular, there are a number of scams present that will leave you paying much more than necessary. First, you’ll want to find an air duct cleaning company that adheres to NADCA standards. NADCA stands for the National Air Duct Cleaners Association and is a nonprofit organization comprised of companies dedicated to cleaning HVAC systems. NADCA recommends hiring an air duct cleaning company that is a member of NADCA and is certified by the organization to provide air duct cleaning services; is licensed; has proof of insurance; inspects all air ducts and system components as part of the cleaning process; and, avoids sales gimmicks for any furnace cleaning costs or vent cleaning costs, including dryer vent cleaning costs. Air duct cleaning prices vary, but by making sure the company you choose adheres to these standards, you can avoid tricky scams designed to empty your pockets with no guarantee of quality service. Taking the time to clean your air ducts will make your home safer and more comfortable for your family. Fortunately, air duct cleaning is not a task that needs to happen very often. It is recommended that air duct cleaning take place every 5 to 7 years, depending on factors such as if you have pets, smoke, or have a rodent infestation. I Might Have Standing Water In My Crawl Space. What do I Do? As a homeowner, you likely keep a checklist on hand of all the maintenance and upkeep items necessary to keep your home in tip-top shape. While it’s easy to remember to dust and vacuum, make repairs to the siding of the house, and other jobs that impact the aesthetics of the house, what about maintenance of those places that aren’t as visible? Many of us don’t bother to think about what’s going on beneath our feet, underneath the house. However, paying attention to what’s below, mainly standing water under houses, is essential when purchasing a new home or maintaining the home you have. Read on to learn what crawl spaces are, how water collects in these spaces, and tips on how to fix water in crawl spaces. 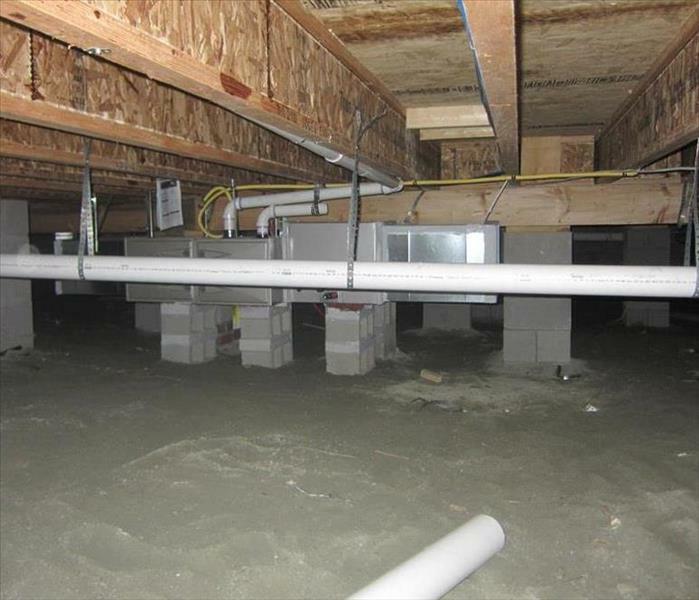 Simply put, crawl spaces are hollow areas between the ground and the first level of a house. As the name implies, crawl spaces are just high enough for a person to be able to crawl in, ranging between 1 and 3 feet high on average. One of the primary benefits to crawl spaces is that they allow for easy access to the “guts” of a home, such as the heating and cooling systems, plumbing, and electrical wiring. Having this type of access to these important components to a home prevents costly excavations should any problems arise with these systems. While it is true that basements do serve as an access point for these components of a house, crawl spaces are less expensive. Another benefit to having crawl spaces in a home is that they prevent moisture from building up in the basement level of a house. Crawl spaces are well suited for particularly moist, coastal regions where water might find its way through holes and cracks and into the basement. There are a number of different causes of flooded crawl spaces. One of the most common causes of standing water in a crawl space is humidity from the ground. Many crawl spaces feature an earthen ground of soil, which acts as a sponge for water coming from above or below. Eventually, the water in the soil will rise to the surface. Once this happens, puddles will begin to form. Another cause of standing water in crawl spaces are issues with a home’s foundation. Home builders will often use inexpensive block foundations during construction as a way to cut costs. However, concrete block foundations often experience cracks and other issues. Over time, these cracks in the foundation can result in water seeping into and collecting in crawl spaces, leading to flooded crawl spaces. Another foundational issue that can lead to water in crawl spaces is the use of stone foundations. Similar to cheap block foundations, stone foundations are prone to cracking, letting air and water into crawl spaces. Other causes of water in crawl spaces include occurrences of heavy rain, as well as plumbing leaks. There are a few tell-tale signs that indicate you might have a flooded crawl space. One of the signs of standing water in a crawl space is wood rot. While dry wood is incredibly durable, when wood is exposed to moisture for a prolonged period of time it becomes vulnerable to fungi that can cause it to rot. As the decay worsens, wood will become soft, discolored, and will begin to smell. In addition to wood rot, another sign of a flooded crawl space is the prevalence of termite damage. When water begins to damage the wood in your crawl spaces, it can attract pests such as termites. Termites and other insects that are drawn to water-damaged wood can cause serious issues in a home, resulting in a great deal of structural damage. Other signs of standing water in a crawl space include “cupping” of hardwood floors, as well as visible mold growth in the crawl space. Molds of a wide variety flourish in damp, wet areas like crawl spaces, where water often accumulates. Once mold grows, there are increased health risks should spores become airborne and find their way into a home. Standing water in a crawl space should not be overlooked or taken lightly, as the presence of this issue can seriously impact the value of a home. While the standing water itself will not decrease a home’s value, the challenges associated with standing water, such as termites, structural damage, and mold, can significantly affect the appraisal value of a house. Large growths of mold in a crawl space, especially if it is determined that the mold is black mold, can put you and your family at risk for health issues. Further, an overgrowth of mold in a crawl space can require a costly remediation process to remove the mold. If you suspect standing water, crawl space water removal is essential. So how to fix water in crawl spaces? Fortunately, there are steps in the crawl space water removal process to fix water in crawl space issues and prevent future collection of standing water in crawl spaces. One of the first steps in addressing water in crawl spaces is to ensure there is proper ventilation. Dehumidifiers and crawl space ventilation fans effectively keep the level of moisture in a crawl space low enough so that water does not begin to puddle. Another step for crawl space water removal to tackle water in crawl space is to ensure gutters and downspouts are installed and well-maintained. These systems are designed to direct the flow of water away from the home, therefore it is essential that they are kept in working order to prevent standing water in crawl spaces. If repairs are needed, they should be completed in a timely manner. Additionally, to prevent standing water in crawl spaces, homeowners should equip the house with interior and exterior waterproofing, and install encapsulation systems to create a barrier between crawl spaces and the ground below. Taking the time for proper crawl space water removal and to adequately protect your crawl space from moisture can save you money on potential repairs, while also ensuring your home maintains its value over time. Contact a specialist today to discuss standing water under houses and learn how they can help fix existing problems and prevent future occurrences of standing water in crawl spaces. The Cost of Black Mold Removal: Should I Buy A Home With Mold? Is your perfect house still worth moving into if it has black mold? Imagine, you’ve scoured your favorite neighborhoods for months in order to find the perfect new home for you and your family. After long deliberations and discussions over cost, distance from work, proximity to schools, and more, you’ve narrowed your search to the perfect home and are ready to make an offer. Unfortunately, you find out that the house is not so perfect, as it is home to black mold. What should you do next? Do you proceed with the purchase and explore mold removal costs, or, should set your sights on another option? Determining whether or not to purchase a home that has black mold first requires an understanding of what black mold is, the potential consequences of living in a space with black mold, and the mold remediation cost required to rid the house of this intrusive growth. Before jumping into mold remediation costs, let’s first understand what black mold is. Also referred to as “toxic mold,” black mold is the common term for the type of mold called Stachybotrys Cchartarum. Mold is a type of fungi, surprisingly similar to things we eat every day like yeast in bread or mushrooms. There is cause for concern for black mold, as its very small spores are incredibly light in weight, making them easily become airborne. Once airborne, they can be inhaled by individuals in the vicinity. Some forms of mold produce harmful toxins, called mycotoxins, that can have a particularly negative impact on health. For this reason, if you notice mold growing in your home, it’s important that you do not touch or disturb it. Identifying whether a particular mold growing in a house is black mold is difficult for the average person, as many different types of mold can grow in the same space, and can have a similar appearance. If you suspect the home you wish to purchase has a mold problem, contact a professional immediately who, as part of their mold removal cost, will help determine the type of mold growing and the severity of the case. While black mold can grow in a number of spots throughout a home, they are particularly prone to growing in warm, moist spots, such as attics, basements, and crawl spaces. Mold remediation costs cover the various spots where mold is likely to grow. Attics: Because many attics are not equipped with proper ventilation, various types of molds prosper in these spaces. Attic mold growth is perpetuated when moisture from the lower levels of the home rise and become trapped in this top level of the house. The issue of attic mold is worse when kitchen and bathroom fans or even dryer vents exhaust into the attic. This is because these channels fill the attic with additional warm, moist air mold needs to thrive. To reduce moisture and thus the growth of mold, an attic requires sealing, insulation, and proper ventilation. Basements: Like attics, basements are prone to the collection of moisture due to their often dark, damp nature. Basement mold results when moisture collects and flows through small holes and cracks in the home, draining into the lowest level. Homes built from porous materials will have more issues with moisture, as they promote the flow of water throughout the home. Before purchasing a home, determine whether the basement has proper ventilation, whether the rain gutters effectively push water away from the foundation, and whether there has been adequate maintenance and construction to prevent moisture buildup and subsequently basement mold. Crawl Spaces: Many of us avoid venturing into crawl spaces, leaving us unaware of whether or not crawl space mold is growing in these spots. However, because crawl spaces are often warm and damp, they can be a breeding ground for black mold and other types of crawl space mold. In fact, because lots of crawl spaces have exposed earthen floors, ground moisture raises the level of humidity in the space. Because mold is always present inside and outside of a home, it is virtually impossible to truly remove all mold. Therefore, when particular cases of mold growth occur that require professional attention, we refer to this as remediation. Quality mold restoration companies will not promise to remove all mold and instead can efficiently and effectively return mold levels in a home back to normal, natural levels. The first step to house mold removal is repairing the source of moisture to prevent the collection of water in mold-prone spots of the home. Ensuring that basements, attics, and crawl spaces are properly ventilated, sealed, and insulated is therefore of particular importance. If this step isn’t taken, the mold will likely come back after the remediation process. Next, the area of the home where the mold is growing should be sealed off, particularly any doorways or other openings that lead to other areas of the home. Doing this helps to prevent the spread of mold spores into other spaces during the house mold removal. As mentioned, inhaling mold spores can have serious consequences to one’s health, so everything should be contained when tackling this issue. Now, only when wearing a face mask or respirator, a professional can begin the house mold removal process by destroying any visible mold and disposing of mold-infested materials using antifungal and antimicrobial treatments. The exact type of treatment used will largely depend on the type of mold growing and the amount of mold growth. Because the house mold removal process might require the removal of drywall or carpet, small repairs might be necessary following the process. Next, let's explore mold remediation costs. For quality, long-term remediation of a mold issue, paying the mold removal costs for a specialist is essential. Determining the exact mold remediation cost depends on factors including the extent of mold growth impact price. When a mold infestation is contained to a single area, the mold removal cost will be less than if air ducts are involved, or if there is extensive mold growth following the flooding of a home. 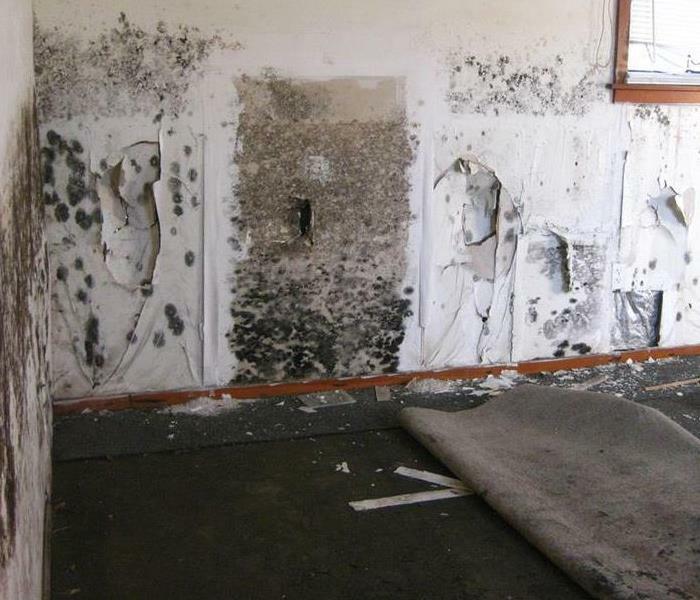 Contact a specialist to discuss the specifics of your case to determine the mold remediation cost for your situation. When trying to decide whether or not to buy a home with black mold, consider how soon you plan to move in, whether you or your loved ones have any health issues that could be made worse through exposure to mold, and whether you can afford the mold remediation cost. If you plan to move in immediately, it is likely not a great idea to move into a home with a black mold infestation. On the other hand, should you have the flexibility to delay a move in and have the money for mold removal costs, the black mold should not deter you from purchasing your dream home. As familiar as it might be to Atlanta homes throughout the year, there is very little that most homeowners even know about mold growth. While you might work hard to keep your house clean and free from potential problems, mold colonization in moisture ridden areas can happen to any residence. There are very few things that are a requirement for fungal growth, and the interior of your home gets constructed with one of these: organic materials. Yes, for spores to turn into colonies, you need warm temperatures, moisture, and organic materials. Considering that many of the interior walls of your home primarily consist of drywall and wood, there are little stopping spores from seating on these surfaces if the other conditions get met. Preventing mold damage to your Atlanta home is often a battle of keeping your home dry, and understanding that regular inspections of critical components intended to keep moisture out can aid in preventing colonies from forming. There is no mistaking that mold growth has gotten linked to potential health effects for you and your family, so it is nothing to put off until a favorable time. While ultimately this process is successful through the employment of SERVPRO IICRC certified remediation specialists, there is a specific reason why professional restoration is a requirement for success. Most often, conventional cleaning methods only scratch the surface (literally) of the problem that you are facing. Instead of penetrating deeply enough to uproot and remove the entire organism that is thriving (hyphae), your cleaning methods are only useful on the limited depth that your cleaning utensils can reach. This process merely puts a bandage on a problem that returns after a short while. Applying a product such as bleach can also add to the moisture source that molds crave for expansion. Instead of not fully correcting the fungal problem, you can trust in the experience and diligence of our SERVPRO remediation technicians. From the moment that we arrive, we get to work on blocking off the affected area from spreading further while also working to locate the source of the moisture and repair it if possible. While this is only a small piece of the remediation process, it can show the dedication and experience found in every technician at SERVPRO of West Atlanta / Downtown. If you are facing mold damage in your home, do not hesitate to call us at (404) 835-0200. It is important to store items like gasoline, turpentine, and paint thinner properly to prevent fire damage. 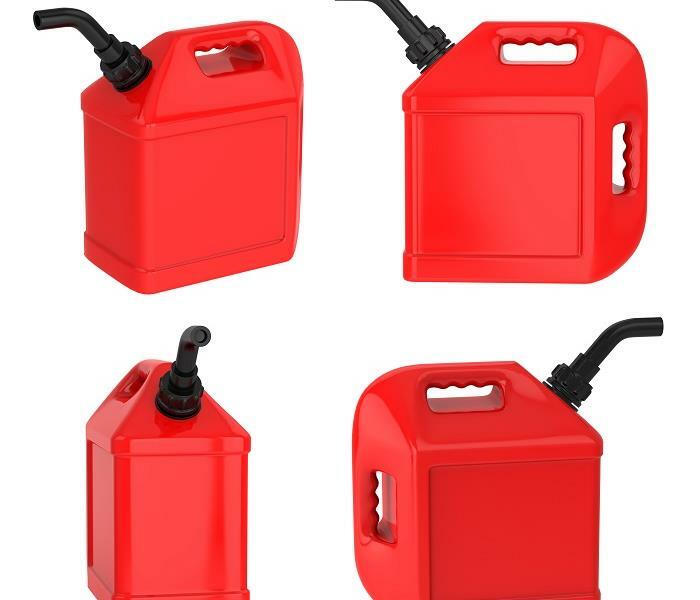 If you store flammable liquids in your Atlanta home’s garage such as turpentine, gasoline, or paint thinner, they can be dangerous if not stored properly. Gasoline alone starts around eight thousand house fires each year. A reason this happens is that it is often stored incorrectly in the garage. For instance, when stored in a glass jar with a metal lid, the lid can create a spark if the jar falls off the shelf. Flammable liquids in your Atlanta home should always be stored at room temperature away from any heat sources in the proper containers. If you have suffered a fire and fire damage from one of these catching fire, however, you want to get the damage taken care of as quickly as possible once the fire is out. Our SERVPRO staff can assist you in cleaning and repairing your home, as we are professionally trained to do so. Many times, fires cause structural damage to buildings, which can pose safety hazards. We are always cautious of falling or loose debris and watch for damaged structural components which could cause puncture wounds. We wear work safety boots and hard hats for added protection when inspecting your home after a fire. We also keep you and your family out until we ensure that it is safe. Warnings of potential risks are made known with barrier tape and signs. SERVPRO staff also need to be aware of trip, slip, and fall hazards. Most of these accidents can be prevented by following some simple measures. We inspect your home for potential slippery surfaces and tripping obstacles. Wet floors from putting out the fire can be slippery, or a dry floor can be hazardous if a surface nearby is wet. Structures which are damaged by fire can present different trip and fall hazards. Walkways, floors, and aisles should be kept clean, dry, and free of any protruding splinters, nails, holes, loose boards, or projections. Holes in the floor are covered as well. SERVPRO of West Atlanta / Downtown ensures that you and our workers are safe while we are restoring your home in Centennial Place, Mechanicsville, or Reynoldstown after fire damage. Reach out to us right away at (404) 835-0200 once the fire is out so we can begin helping you. Click here for more information on the city of Atlanta. Toilets can easily overflow causing a great deal of damage if it is not caught quickly. Contact SERVPRO right away after an event for best results. 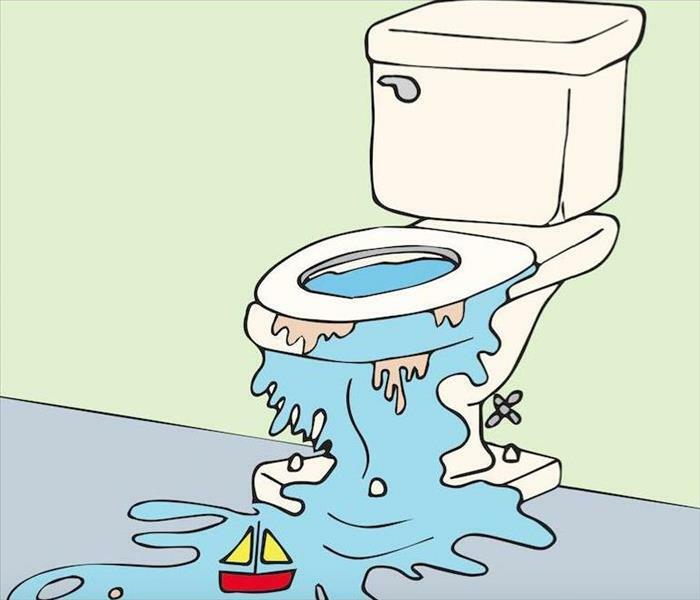 An overflowing toilet is one of the leading causes of water damage in homes in Atlanta. The damage can be immense, whether the tank malfunctioned or there is a clog in the bowl. The damage can be even worse when the bathroom is on an upper floor of your home and water flows down to lower levels of your home. You could be looking at damaged insulation, ceilings, flooring systems, and water inside wall cavities as well. A water damage emergency in Atlanta such as this requires immediate attention. Not only do you need water removal services to get rid of the water, but you need help restoring your damaged home as well. Our SERVPRO staff has all the needed training, experience, and professional tools to do the restoration work for you in a timely fashion. We identify the scope of the damage after arriving at your home, both seen and unseen, by using hygrometers and moisture detectors. We also help you as the homeowner overcome your feelings of helplessness by explaining the whole remediation process to you before we begin and as we go along. SERVPRO staff then extracts all the excess water with heavy-duty, truck-mounted pumps. We remove as much of the water as possible so that the drying process is easier. Once this is done, professional strength dehumidifiers and air-movers are used to finish the drying process. Depending on how much damage the water has created, some materials like subfloors, flooring, drywall, and ceiling materials might need demolishing and removing so that we can salvage the substructure and framing. Doing this also helps prevent mildew and mold from growing, and we can dry the structure out more thoroughly as well. We also separate and store your personal property and salvage what is possible. Once everything is dry, we also clean and sanitize the affected areas to keep bacteria and mold from growing. We can then do any rebuilding that is necessary. We work alongside professional contractors when this step requires a good amount of construction. When this is complete, we can then put all your personal belongings back in place. SERVPRO of West Atlanta/Downtown wants to ensure that your home in Mechanicsville, Downtown Atlanta or Reynoldstown is thoroughly dry again after a water disaster. Give us a call at (404) 835-0200 as soon as you experience any water damage emergency so we can get your home back in order. Click here for more information regarding the city of Atlanta. Your Atlanta bookstore might be a well-established facility for all of the readers and researchers in your area, but that same foot traffic is what pays the bills and keeps your business in the black. When disaster strikes your building and leaves high volumes of water on the floors throughout your business, professional restoration is one of the best solutions to get your doors open again to that critical customer base more expediently. 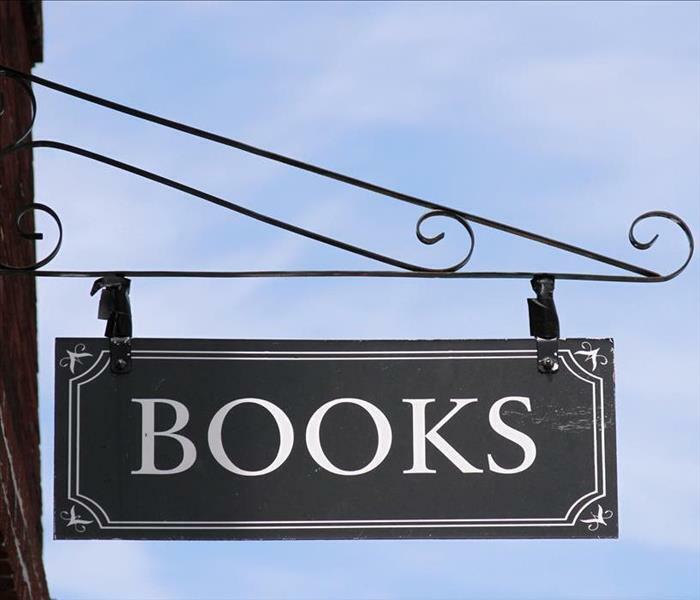 When your Atlanta bookstore requires water removal services along with restoration efforts, there is typically quite a lot on the line to getting the issue resolved promptly. No matter which area of your shop takes the brunt of the water damage, there are constant considerations you have to concern yourself with as the owner. The amount of time that your shop has to remain closed for restoration, damage to your books and other stock, time off for employees that count on a paycheck, and also the threat of costly substantial structural damages, all matter. When our SERVPRO technicians reach your storefront, it is critical for our team to look at the full scope of the damage, as we prepare for the extraction. Removing the water from the area is often a task for a combination of our equipment. With higher volumes of water to extract, the most efficient means of pulling the bulk out of the affected area is through one of the pump trucks in our fleet. Spot extractions follow suit after this, using both portable pumps and wet-vacs for small and inaccessible places. Drying the area completely is a critical component of our restoration process. Our SERVPRO professionals utilize several different tools for this step as well, based on the severity and size of the dampened areas. For inaccessible areas that commonly remain damp following flooding or excessive water damage, our technicians utilize equipment like our Injectidry system to get inside of walls and dry them out entirely. Moisture reduction is crucial to prevent books from absorbing to dampness or degradation. When your bookstore falls victim to a water emergency, time is often of the essence. Contact SERVPRO of West Atlanta / Downtown. Our experienced technicians are available 24/7 for any restoration need you might have. Call us today at (404) 835-0200. Dive into this large thriving downtown metropolis by clicking here. Surviving a flood on your property should always be the first step, dealing with what gets left behind can come later. However, cleaning and restoration are often overwhelming for most homeowners to tackle on their own. You need the right tools, equipment, and resources to treat flood damage in your home correctly and be aware of the possible health risks involved in the work. Floods can be emotionally and physically exhausting. However, as soon as you get word from local authorities about receding water flow and receive an all-clear about returning to your home after a flood, contact a restoration company. Flood damage in your Atlanta area home only gets worse the longer you wait, get help documenting the damage and start on your home's recovery right away. Just remember, never enter your home alone. Have a qualified professional with you that can help you avoid causing further damage and any possible hazards that might exist. Flood waters often drag anything and everything along with it, causing contamination to be a primary concern. Without the proper equipment, you can expose members of your family to biological and chemical waste. SERVPRO helps you get debris and damaged household goods out of your home quickly and efficiently. With an expedited debris removal process, items that would otherwise sit on your lawn for weeks, or even months, get hauled away immediately under normal circumstances. It also gives our technicians the room they need to begin work on the inside of your home. SERVPRO gives you a better chance of restoring furniture, appliances, electronics, and personal belongings caught up in the event. Your refrigerator, washer/dryer, air conditioner, stove, water heater, dishwasher, television, computer, stereo, telephone, lamps, and other household goods may not be as damaged as you might think. Each can benefit from an inspection provided by a qualified professional. SERVPRO has access to water extraction and drying equipment of all shapes and sizes, which allows us the opportunity to get water out of your home faster than ever before. Infrared moisture detectors, hygrometers, air-movers, drying, cleaning, deodorizing and disinfecting after a flood has never been more manageable. Business Contact Info for Atlanta by clicking. 3/4/2019 - Mold And Your Health: Does Being Exposed To Mold Cause Health Problems? 2/25/2019 - What To Do When Your Basement Floods? 2/18/2019 - How Much Should I Expect To Pay For An Air Duct Cleaning? 2/11/2019 - I Might Have Standing Water In My Crawl Space. What do I Do? 2/4/2019 - The Cost of Black Mold Removal: Should I Buy A Home With Mold?